Is an injury or condition preventing you from exercising? The human body requires roughly 150 minutes of heart-elevating exercise each week. For those who are chair-bound or lack mobility, this guideline can be challenging to achieve. I’ve created an effective, energizing fitness routine that can be completed from the convenience of your chair. All you need is a 5-10 lb. medicine ball. For the following exercises, keep the knees aligned with the heels and the shoulders stacked over the hips. Pump up your arms and your pulse by practicing air punches. Doing so increases the flow of oxygen and nutrient-rich blood through the body, in addition to toning triceps, biceps and chest muscles. 30 Seconds of High Jabs: Remain in an upright position with your shoulders back and core muscles engaged. Elevate your fists to eye level and alternate arms as you punch upward, fully extending the arm on each jab. 30 Seconds of Front Jabs: Sit up tall and bring two clenched fists to your jawline. Quickly alternate between extending the right arm fully, then the left. Squeeze your core, chest and arm muscles with each swing. 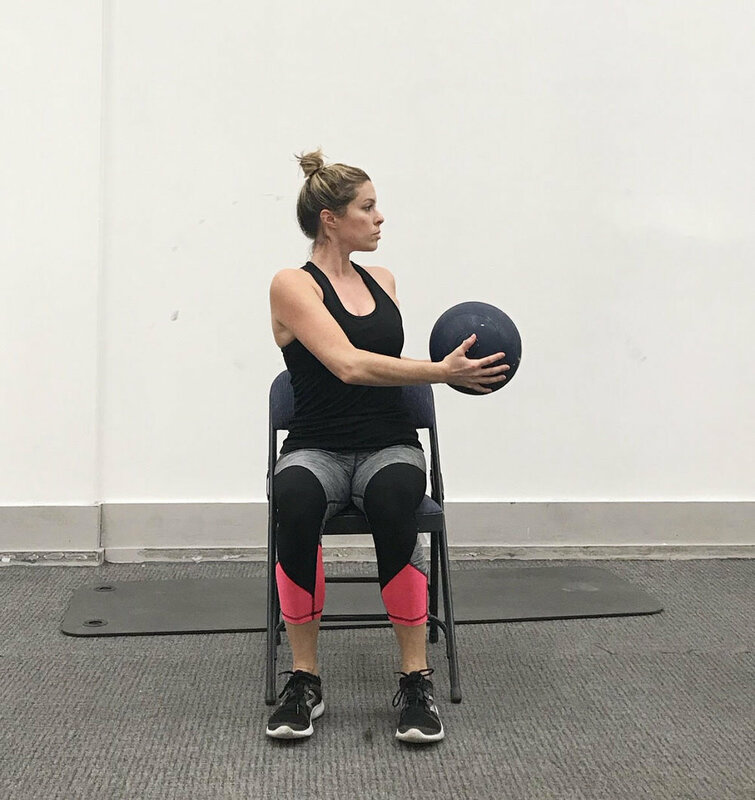 Incorporating a medicine ball into this movement forces the chest, biceps, triceps, shoulders, back and core muscles to stay active throughout the entire movement to prevent the ball from dropping below the chest line. For this exercise, stay within the 5-10 lb. medicine ball range to avoid compromising lower back safety and stability. Begin by holding the medicine ball at your chest with the elbows pointed slightly out. Keep your core muscles tight as you push the ball out in front of the body. Hold for 2 counts then retract the ball back to the starting position. Repeat for 12-15 repetitions. Muscle imbalances lead to joint injuries. Opposing muscles, like biceps and triceps, require equal amounts of exercise in order for the elbow and shoulder joints to work properly. Strong triceps are also important for generating a greater force when pushing an object. Take a deep breath, bringing your shoulders back, chest out and chin tucked so the ears are aligned above the clavicle (collarbone). Holding the medicine ball with a firm grip, elevate it over your head. Keep your elbows close to your ears. Lower the ball behind your head until you feel a slight pull on the backs of your arms. Hold for 1-2 counts then return the ball back to the starting stance. Repeat 12-15 times. The human spine is composed of five sections (from the top): cervical, thoracic, lumbar, sacrum and coccyx. The thoracic portion of the spine is located roughly in the middle of the back and is responsible for rotation and trunk mobility. In order for the thoracic to operate properly we must practice exercises that promote thoracic mobility and lumbar stability. Abdominal rotations can improve your range of motion, lower back health and help prevent kyphosis (curvature of the upper back). In order to accurately target the thoracic area, twist from the torso, not the hips. Your hips should be grounded and stationary throughout this entire exercise. Firmly hold a light medicine ball to the chest. Take a deep breath and on the exhale slowly rotate your torso and ball to the right. Remember, you should not be shifting at the hips. Move carefully through this motion to master it. Hold for one count then rotate the ball to the opposite side of the body. Avoid dropping the ball below the chest line. Repeat for 60 seconds. The quadriceps are a large, important muscle group located in the anterior part of the leg. They are responsible for walking, bending and knee extension. 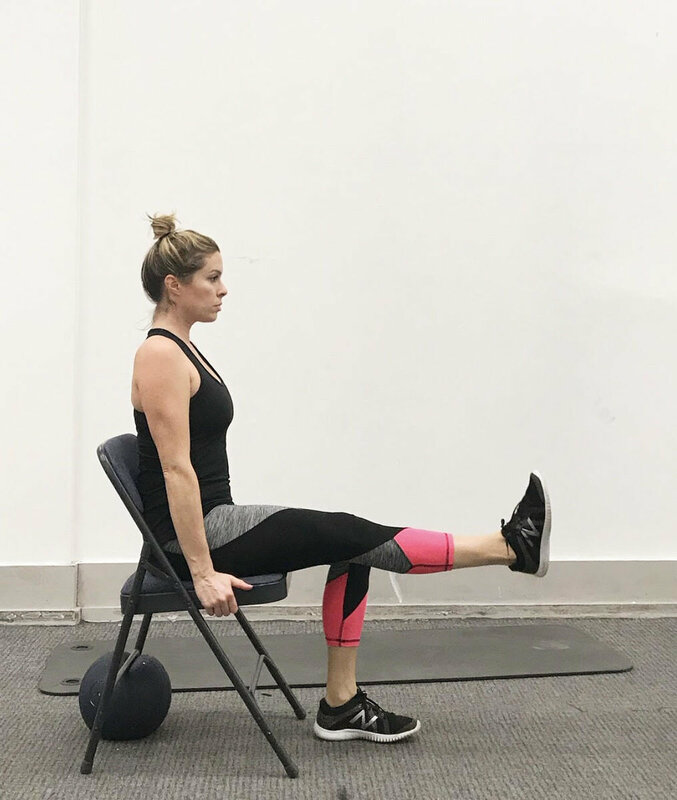 This movement targets the quads without adding dangerous force to the knee joint. Position the feet so they are hip-width apart with both knees bent at a 90 degree angle. Keeping your ankle flexed at 90 degrees, elevate and straighten the right leg. Tighten your entire leg. Hold for 2 counts. Once you complete 20 repetitions on the right, repeat 20 times on the left leg. Don’t let limited mobility be a barrier between you and a great workout. This article was featured on philly.com.